For me, nothing says August like a pot of ratatouille! Eggplant, zucchini, tomatoes, bell peppers, onions -- all the best of summer produce, all brought together in a French classic. 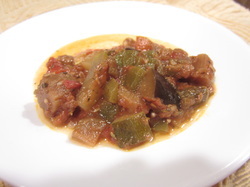 This is my go-to recipe for ratatouille, adapted from Mollie Katzen's recipe in The Moosewood Cookbook. It does take a bit of time to chop all of the vegetables needed, but you can do all of that a day or two in advance of cooking. The only things I hold off on are crushing the garlic and chopping the fresh tomatoes. Although I use a can of tomato puree, you can certainly cook down your own to make everything fresh and local! Oregano, dried 1 1/2 tsp. Herbes de Provence, dried* 2 tbsp. Rosemary, dried, powdered or crushed 1/2 tsp. 2. Heat olive oil in large, heavy cooking pot. Add crushed garlic to oil, heat until fragrant. 3. Add bay leaf, onion and salt; saute over medium heat until onion begins to turn transparent. Add herbs. 4. Add eggplant, wine and tomato puree, stirring to mix well. Cover and simmer for approximately 20 minutes over medium-low heat, until eggplant is easily pricked by a fork. 5. Add zucchini and peppers, stirring well. Cover and simmer 20 minutes over medium heat or until zucchini have begun to soften. 6. Add additional salt, pepper and tomatoes. Mix well and continue to cook over medium heat for at least 20 minutes, until all vegetables are tender. 7. Taste; add more herbs, salt, pepper or wine as needed. Cook for at least five minutes after adding additional ingredients to allow flavors to blend. 8. Just before serving, mix in fresh parsley. Serving suggestions: Serve as an entree over brown rice or with good sourdough, French or country bread, or serve as a side dish. * If you don't have Herbes de Provence handy, substitute 2 tsp. dried basil, 21/2 tsp. dried marjoram, 1/2 tsp. oregano and 1 tsp. dried rosemary. Opening Day is June 22nd! PUTNAM, CT, JUNE 2012: The Putnam Saturday Farmers' Market (PSFM) opens for the 2013 season on Saturday, July 22nd at the Putnam Riverview Marketplace, located at 18 Kennedy Drive. The Market is open from 10:00 a.m. to 1:00 p.m. on Saturdays from June 22nd through October 19th. To celebrate opening day the PSFM will be giving customers a reusable PSFM shopping bag (while supplies last) as a thank you for keeping our market going. Five of last year’s farmers – Indian Spring Farm, Maple Brook Farm, Meadow Stone Farm, Palazzi Orchards and Woodstock Farms – will be joined by three new regulars: Abington Grown/We-Lik-It, Blueberry Hill Organic Farm and Farmed It. Aspinock Spring Pottery will also be at the market on the 22nd, selling its handmade pottery and fused glass. Mon Chi Tree will be at the market the following Saturday, June 29th, selling jewelry and home décor items. To see images of these artisans’ work, learn more about the farmers and get more information about the PSFM’s upcoming events go to the Market’s web page: http://www.putnamfarmersmarket.org. Themes for future weeks will include summer activities, dog days, gardening, community resources, the value of Scouting and the cost and nutrition advantages of buying local produce. If you are interested in becoming part of the market you can visit the web page or contact the Putnam Economic Community & Development office at 860-963-6384. We're very excited about the upcoming 2013 season and our new website. 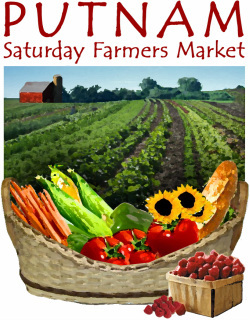 We hope to see you soon at the Putnam Saturday Farmers' Market!